The writing is finally on the wall for Blockbuster: the video rental chain, ubiquitous for years across the US, is finally closing its last 300 retail stores across the country. With that, the company has effectively exited the US retail market — in addition to closing its stores, the company's Netflix-style disc-by-mail service will also be shuttered. "This is not an easy decision, yet consumer demand is clearly moving to digital distribution of video entertainment," said Dish CEO Joseph Clayton in a press release. The online streaming rental service Blockbuster Now will live on, and Dish will retail licensing rights to the Blockbuster brand. Both the retail stores and Blockbuster's disc-by-mail service will be shut down by early January 2014. It's a move that's been a long time coming — Blockbuster stores have been closing in waves for years now as Netflix ate away at its customer base, first through its DVD by mail program and later with its streaming service. 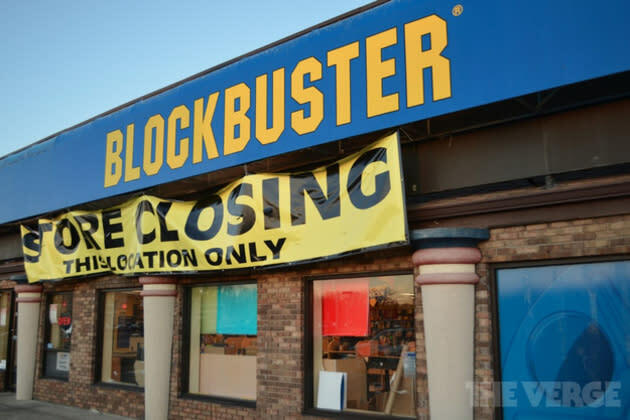 At its height, Blockbuster operated more than 9,000 stores around the world, but in less than a decade its retail presence has been effectively wiped out. It's yet another sign that physical media is all but obsolete for most movie-watchers — in an age where video game consoles, DVRs, and dedicated set-top boxes can bring a huge movie library to your home, it looks like there's no place left for the former king of rentals.